Shiseido Parlour is serving grape parfaits and chestnut desserts until September 30 at its Salon De Café branch in Ginza. Grapes and chestnuts are two foods enjoyed in Japan during autumn. This parfait is made with sweet and juicy shine muscats along with the best and most delicious grapes of the season. The shine muscats are grown at Iizukakaju Orchards in Nagano Prefecture. The parfait combines all of these grapes with homemade sherbet which perfectly complements the refreshing milk ice cream and a grape jelly that tastes great when it goes down. It’s drizzled in a pink grapefruit sauce that adds a sourness and bitterness to the layers of flavour. 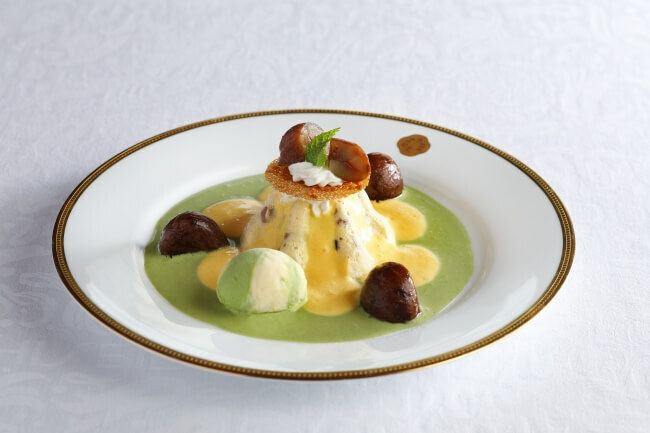 This bavarois is an exquisite combination of chestnuts from Gifu Prefecture and matcha. The large chestnuts are candied in brown sugar and put luxuriously into the bavarois. On top are cookies with orange peel in them and a matcha sauce for added texture. You’ll enjoy tasting the matcha and vanilla marble ice cream together. 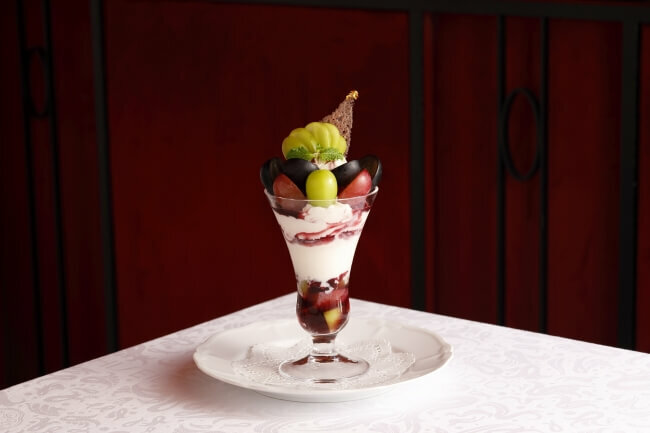 This parfait will be sold at the Nihonbashi Takashimaya, Yokohama Takashimaya and Sogo Yokohama branches of Shiseido Parlour. It’s made with two kinds of grapes from the town of Katsunuma in Yamanashi Prefecture: fujiminori grapes which are juicy and not too sour, and suihou, a white variety of grape that’s sweet with a slight tinge of sourness. Experience the gorgeous flavours of Japan’s beautiful autumn-time desserts. Closed: When Takashimaya Nihonbashi is closed. No fixed holidays. 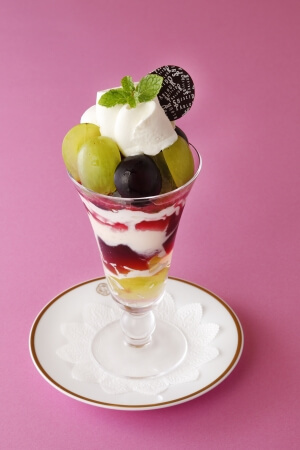 *Due to renovations being made at the Nagoya branch of Shiseido Parlour, a pop-up shop will open in place of it at on the 4th floor of Gifu City Tower 43 where they will sell a Shine Muscat & Kyoho Grape Parfait (¥1,728).